Enhance your new or current home’s beauty by adding a custom-built iron door from Monaco Doors! To ensure quality integrity, all of our iron doors are fabricated onsite in our Frisco, Texas manufacturing facility. We employ cutting-edge technology in our production methods, including internal steel frames and thermal breaks. This proprietary process is light years ahead of the typical “tube-style” iron door that other companies offer. Simply stated, our #1 focus is on building the custom iron door of your dreams! Lead time for delivery is typically quicker than from other iron door retailers, as most other companies import their custom doors from China or Mexico. As part of Monaco Door’s design process, we offer full CAD design capabilities to customize the door to your exact specifications. You can choose one of our existing door designs, or we can produce your very own one-of-a-kind design. Any of our designs can be modified in size, shape, or layout. We can provide installation for your door if you are within our installation area (TX, OK, LA, AR), or the door can be shipped directly to your jobsite anywhere in the U.S. We sell our doors coast-to-coast from California to New York and in some areas, we can provide installation referrals to you. Every Monaco door comes with Baldwin Hardware handlesets, Hager hinges, Endura thresholds and sweeps, and Q-Lon weatherstripping. Top-notch components means less maintenance in the future for you. The Monaco Doors brand is part of Trinity Stairs. We have been manufacturing custom iron doors for many years for clients all over the U.S. 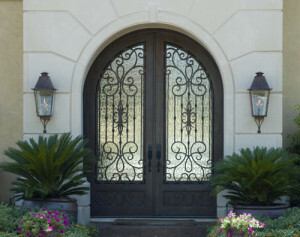 Please view our entire line of iron doors at www.monacodoors.com. We look forward to earning your business!